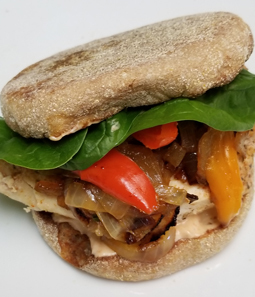 Fiesta Fajita Chicken Sandwich - A recipe from Savor California, the online showcase for extraordinary gourmet foods and beverages from California. Season the chicken and the vegetables liberally with Cowboy BBQ Fajita Seasoning. Mix the mayonnaise with the chipotle sauce to taste and spread on toasted English muffins. Build sandwich with grilled chicken, sautéed vegetable and fresh spinach.